Yes, you knew all along that breakfast is the most important meal of the day, too little of it or skipping it can prove to be detrimental to your health in the long run. Read Breakfast and your health. But did you know that eating your breakfast everyday can keep tooth decay at bay. A study published by The American Dental Association (ADA) suggests that a regular and a heavy breakfast consisting of nutritious food like veggies and fruits for children might be as good as regular brushing and flossing. 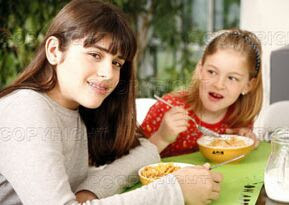 Using data from a survey, the authors of the article mention that “Specifically, not eating breakfast every day was found to be associated with overall caries (tooth decay) experience and untreated decay in the primary dentition in children.” In their analysis of more than 4,000 preschoolers, the authors found that poor eating practices (not eating breakfast and eating fewer than five servings of fruits and vegetables a day) also were associated with caries in primary teeth among children. But is this applicable to adult dental health? Not aware of any studies in this regard, but it is quite evident that if something is supposed to be good for children’s oral health then it is most likely to be good for adults as well. It must be the activity of the acids in saliva, coupled with the abrasive nature of raw fruits and veggies that give breakfast its edge. Of course, it could also be that the care of children who get breakfast, is better in general. Was there a breakdown of income level associated with the study? Yes, you are right. The study was conducted across various income groups. Lower income group children were found to have more dental caries.